Inspired Workshops: Inspired Workshops Ireland Itinerary is HERE! To Reach, Teach and Inspire Photographers to learn the art and business of Professional Photography. Inspired Workshops Ireland Itinerary is HERE! 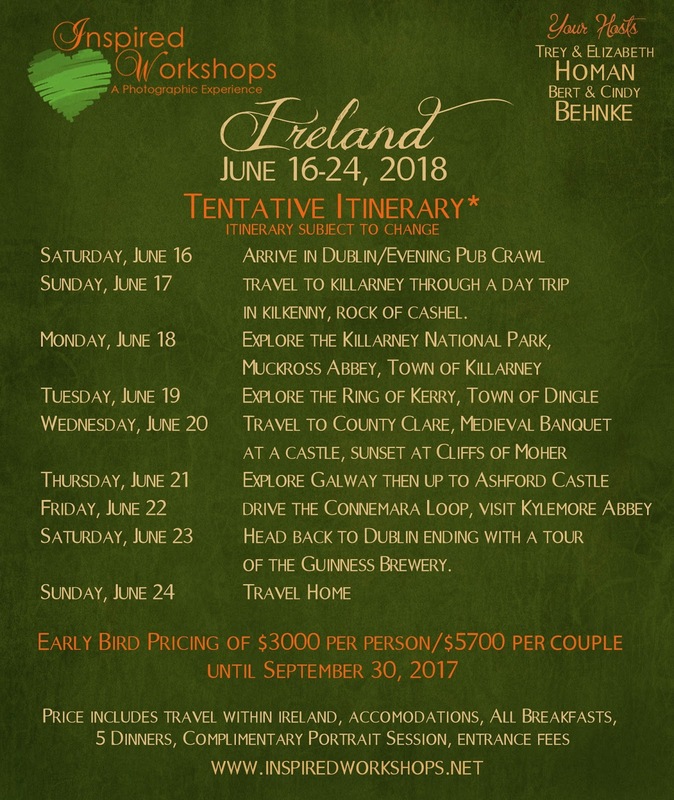 We are so excited to announce the itinerary for our 2018 Inspired Workshops in Ireland! We have put together an amazing mixture of sightseeing, photography and fellowship that everyone will enjoy. Whether you photograph for a living, as a hobby, or you just love sightseeing and capturing images on your iphone, this Inspirational Workshop is sure to rejuvenate your spirit, mind and body. There will be Walking. There will be Castles. There will be Beer. There will be Pubs. There will be Irish Music. And there will be some of the most beautiful landscapes in the world to photograph. It is our hope to be able to provide a gorgeous image of each attendee or couple as we tour this beautiful land...more information about that coming. We do not want our tour group to be TOO BIG, so we are limiting the size to 20 attendees. Here is our tentative itinerary. This hits the highlights, but there will be much, much more as we finalize all the little details. Full Refund less a $50 processing fee if cancelled by September 30, 2017. No cancellations after that date, but you may transfer your registration to another person. Hi there! Welcome to Inspired Workshops. Thank you for visiting. We are Trey and Elizabeth Homan, photographers from San Antonio, Texas. Our goal is to do our part to elevate the level of professional photography. From posing guides to seminars and workshops, we are happy to share our knowledge to help other photographers in their journey to success! I started Artistic Images 20 years ago just out of college. My purpose as a photographer is to create a beautiful keepsake of your child or family that shows the true personality and relationships of the people portrayed in the portrait. I LOVE my job and am extremely blessed to do what I love for a living. I have a husband, Trey, and three beautiful little boys! Life is never boring!